LG has unveiled a fridge powered by Amazon's Alexa. The inclusion of the virtual assistant allows the device to be told to play music and buy goods via voice command. The Smart InstaView also has a 29in (73.7cm) touchscreen that can reveal what is inside and warn if products are near their expiration dates. 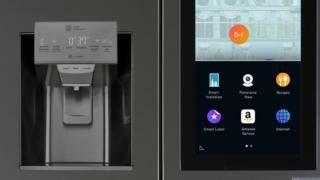 South Korean rival Samsung also announced new fridges with voice recognition at CES - but they don't feature Alexa. LG and Samsung are among several firms adding computing capabilities to what were traditionally thought of as "dumb" household products. By doing so, users can control and check on their devices even when they are some distance from home. In the case of LG's fridge, an app allows the user to see the view inside via a panoramic camera built into its interior. The suggestion was that the owner could then decide to buy milk or other products if they discovered they were running low. The fridge can also remind owners of birthdays and anniversaries of friends and family members.. The device was announced at a press conference at the CES tech show in Las Vegas, kicking off a day of launches from some of the world's biggest technology brands. One analyst at the event was unconvinced. "Voice input is definitely going to be widely used - we're also seeing Alexa being built into other device from other manufacturers, and Google and Microsoft are also making available their own voice-controlled virtual assistants," commented Bill Ablondi from the consultancy Strategy Analytics. "However, when I look at a fridge that you can talk to, that seems like a bit of a gimmick at this point." The refrigerator is not the South Korean firm's only tie-up with Amazon to be revealed at the trade show. LG had previously announced a smart speaker - the SmartThinQ hub - that is powered by Alexa. In addition, at CES it unveiled Hub Robot, a droid designed to sit on a desk and interact with family members. It too uses Alexa to let them ask for information and control other household appliances. CES 2017: Has tech's sensor obsession gone too far?